Lee Hyun-Joong (Choi Soo-Jong) is the leader of the first squad. He's been through many of battles, big and small. Nobody in his company knows his about his past. Hyun-Joong sticks to his principles, but also places his soldier's lives first. His men view Hyun-Joong like a big brother. Yeom Ha-Jin (Nam Sung-Jin) comes from the countryside. When residents were lining up to volunteer for the war, Yeom Ha-Jin lined up alongside them not knowing what he was signing up for. Now, Yeom Ha-Jin's goal is to survive the war and see his wife. His personality is a bit careless, but becomes very serious when battles erupt. Yang Sang-Kil (Hong Kyung-In) is best friends with Yeom Ha-Jin. Yang Sang-Kil takes cares of himself first, often taking supplies from the military. He used to be a gambler, but to his mother he is a very devoted son. Park Joo-Yong ( Ryu Sang-Wook) volunteered to become a medic right before becoming an ordained priest. He volunteered to save lives, but in order to avoid death himself Park Joo-Yong must also kill. During battles Park Joo-Yong performs bravely, but when alone feels tremendous guilt from killing. Jung Taek-Soo (Lee Seung-Hyo) was born into a wealthy family and raised in affluence. His world was then turned upside down when North Korean soldiers murdered his parents. Now, Jung Taek-Soo is full of hostility towards the North Korean Army and acts recklessly. Baek Seung-Jin (Park Sang-Uk) is strong physically with a soft personality. He is simple and honest. His hobby is to play the trumpet. Baek Seung-Jin came over from Sergeant Park's squad and joined Hyun-Joon's squad to protect Kim Beom-Woo. 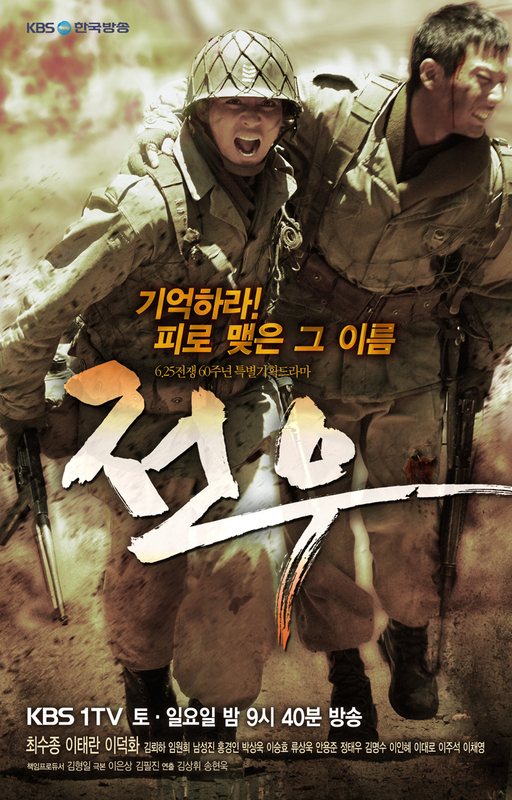 Kim Beom-Woo (Ahn Yong-Joon) is a boy soldier who volunteered with the goal of one day becoming a general. At first he was afraid of battles, but became used to it. To become a general Kim Beom-Woo believes he must receive a medal and because of this often acts without thinking. Gad Timothy Nov 27 2015 6:21 pm This is my favourate War Serie Movie, it covers almost all military commandship, military logistics, military intellingence, military strategy, military tactics, brotherhood, dicipline, and many much more. A Sep 15 2015 11:31 pm Like So Ji Sub's "Road No. One," this series is overlooked and under-rated. Yet no country produces better war films than Korea. "Comrades" is gritty, brutal, and realistic, yet compassionate and heartbreaking: we care about these characters and weep for them. The horror and grief of war on both sides are the sane response to the carnage and waste, caused by the viciousness and stupidity of war mongers. It is one of Korea's best dramas, with some scenes as brilliant as any you will ever see. harriett garin Nov 03 2013 5:26 am i watched this Korean war drama for so many times and still couldn't stop..it moved my heart very much.This show shows how war is difficult...from innocent people to soldiers.. officials or not.I cried a lot esp to those 3 young soldiers..Kim Boem Woo who dreamed of becoming a general someday killed infront of his officials...Park Joo Yong a soon to be ordained priest and voluntarily joined the army to become a medic died in North Korean uniform and Jung Taek Soo whose parents were killed by North Koreans become disabled when he was shot saving Kim Beom Woo.The bullet penetrated his spine and wasn't able to walk again.But it was more hard for the leader to cope....he lost great soldiers whom he treated like his own brother.Thank you for making this drama..
James Sep 05 2013 12:38 am In the first two minutes of the first episode I had to stop watching. The Americans, not the U.N (what a joke), not the South Koreans saved the day. Just the initial commentary (something like a news report) is a slap in the face: B.S. MK Mar 03 2013 8:33 pm I absolutely LOVE this drama and such a great depiction of what the Korean war was like, plus how each side struggled in this conflict. More than anything, the characters add a humanistic element which is so endearing, that you just want to hug them! Well done and made movie series! shef Nov 17 2012 2:55 pm Former US Marine, now 73 years old, with much respect for ROK military. Series equals and in some ways surpasses Band of Brothers. Captures many emotions of comrades in arms, and futility of armed aggression, ordered by old men, fought by young men. Lesson never learned. Kune Wong Nov 02 2012 10:46 am Action packed and entertaining war movies. Better than Saving PR. Mitchell Plunkett Nov 02 2012 1:03 am I am from Canada and this is one of the best series I've seen in my life. Made me cry multiple times. Very moving story and amazing acting. like I said, Top 10 shows ive seen in my life. commentor Sep 28 2012 11:40 pm Disappointing ending. The evil woman didn't served what she deserved. They shouldn't have let her go with just one shot to death. aviera Oct 26 2011 10:54 pm Is this Korean version Band of brothers alike? Jonjon Oct 06 2010 2:25 am Being an avid fan of historical dramas, I like this war drama. A bit gratuitous when it comes to violence but wars are truly hell. I just hope that North and South Korea can reconcile their differences soon and eventually reunite. That sad song (what's the title of that one?) whenever Lee Soo-Kyung and Lee Hyun-Joong provides a powerful dramatic effect on such scenes. By the way, Jung-Hwa almost got my attention - until Miss North Korean camp commandant showed up in episode 12. What's her name by the way? fadz Sep 19 2010 8:22 am I'm from Malaysia. I like this film very much.very interesting drama. Lydia Sep 19 2010 8:04 am this is one war drama that i wouldn't want to miss every Saturday & Sunday. i really like how they're bonded under HyunJun's leadership. i think each casts acted really well. Alien Sep 13 2010 6:24 am Can someone tell me what happened in the end? My KBS was deleted! Thanks! vo xuan thao Sep 12 2010 8:38 am what is the song at the end of every episode?? Alien Sep 07 2010 3:44 am Nice war drama... Dramatic,Romantic,and full of adventures! Can have more? kewl Sep 06 2010 1:29 am Very interesting drama. Sad the ratings are not very high. Should be 50 and above. Anyway, Choi Su-Jong is again excellent in his performance. And so are the rest. PS: Somebody please change the photos for the actors! You can't even identify which is which with the rain and whatnot..
Ct Aug 29 2010 10:43 am i'm from Malaysia & and I watched already this drama & it was very interesting ! Good Job guys, I hope this drama get highest rating, In conclusion, this drama super duper fantastic ! Sad, romantic, fear & brave ! Vo Xuan Thao Aug 20 2010 8:55 pm I like this film very much.I wish your country will reunion in soon.